The amount of heat required to heat a body depends on its mass, the change of its temperature and the so-called specific heat of a substance, which comprises the body. Unit of specific heat capacity has the units in the system SI – (j/kg*K). The specific heat of a body is determined experimentally by using a calorimeter and thermometer. A simple calorimeter consists of a polished metal Cup, then put inside the other metal of glass tubes (for heat insulation) and filled with water or other liquid with known specific heat capacity. Body (solid or liquid), heated to a certain temperature t, is immersed in a calorimeter where temperature is measured. 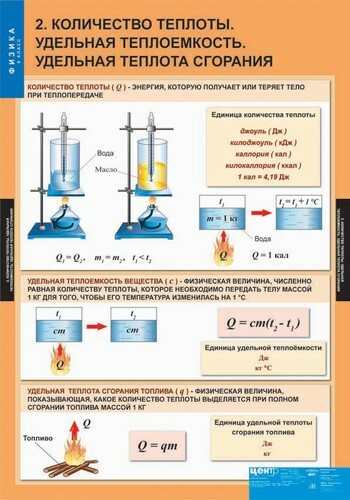 Let the test lowering of the body temperature of the liquid in the calorimeter was equal to t_1, and after the temperature of the water (liquid) and lowered into it the body will be equal, it will be equal ?. here m_1 and c_1 - specific heat and mass of water in the calorimeter, and c_2 m_2 - specific heat and mass of the material of the calorimeter.